Not to be confused with Whitney Houston's Exhale (Shoop Shoop) or Shoop by Salt-n-Pepa. (1963) "The Shoop Shoop Song (It's in His Kiss)"
(1964) "I Can't Hear You"
"The Shoop Shoop Song (It's in His Kiss)" is a song written and composed by Rudy Clark. It was first released as a single in 1963 by Merry Clayton that did not chart. The song was made a hit a year later when recorded by Betty Everett, who hit No. 1 on the Cashbox magazine R&B charts with it in 1964. Recorded by dozens of artists and groups around the world in the decades since, the song became an international hit once again when remade by Cher in 1990. The song was rejected on behalf of the premier girl group of the early 1960s, the New York-located Shirelles, and was first recorded in Los Angeles by Merry Clayton as her first credited single. Clayton had previously provided an uncredited female vocal to the hit "You're the Reason I'm Living" recorded by Bobby Darin as his debut on Capitol Records, and Darin had subsequently arranged for Clayton herself to be signed to Capitol. The composer of "It's in His Kiss", Rudy Clark, was a staff writer for TM Music which Darin headed. Clayton's recording of the song was produced by Jack Nitzsche, and featured Hal Blaine on drums and the Blossoms as chorus. It was released as a single on June 10, 1963, without success. Clayton recorded the song again for the soundtrack of the 1987 comedy film "Maid to Order" in which she, as the character Audrey James, performs with fictional band the Loaded Blanks, played by the rock band Great White, in the film's climactic scene. Calvin Carter, the chief A&R man for the Chicago-located Vee-Jay Records, found "It's in His Kiss" while visiting New York City in search of material for the Vee-Jay roster which included Betty Everett. After Everett had a hit with another song Calvin Carter brought back from New York City, "You're No Good", Calvin Carter suggested Everett cut "It's in His Kiss" as the follow-up single. Everett – who found the song puerile – reluctantly agreed. The accompanying vocals on Everett's recording were provided by Vee-Jay session regulars the Opals, a trio of teenage girls (Rose Addison, Myra Tillison, and Rose "Tootsie" Jackson) from East Chicago, Indiana. Dave Marsh in his book The Heart of Rock and Soul opines that Betty Everett's version, "while [credited] as a solo performance is one of the finest girl group hits, undoubtedly the best one made outside the genre's New York City/Philadelphia/Los Angeles "axis"". Everett's version of "The Shoop Shoop Song" reached number 6 on the Billboard Hot 100 chart in the spring of 1964: at the time Billboard was not publishing its R&B chart but her cover was a number 1 R&B hit according to Cash Box. 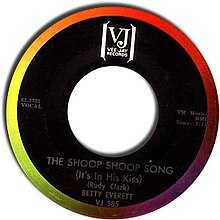 In international release, Everett's "The Shoop Shoop Song" was also a hit in Australia reaching number 21 but was initially overlooked in the UK although Everett's minor 1965 U.S. hit "Getting Mighty Crowded" (number 65) would reach number 29 in the UK. In 1968, the label President Records reissued both songs on one single, with "The Shoop Shoop Song" as the A-side, that peaked at number 34. The next evident recording of "It's in His Kiss" was made in Los Angeles by Ramona King, an R&B singer from San Francisco: this version was produced by Joe Saraceno and former Phil Spector associate Jerry Riopelle and released on Warner Brothers in February 1964, the week prior to the release of Everett's version. Although Everett's single was more likely to receive airplay due to her being an established hitmaker (with "You're No Good"), Vee-Jay feared losing sales to the King version and opted to distinguish Everett's version by issuing it under the title "The Shoop Shoop Song" referring to the song's background vocals. "(Remember the Days of) The Old Schoolyard"
(1974) "It's in His Kiss"
(1975) "Rock and Roller Coaster"
"The Shoop Shoop Song" first became a major UK hit in 1975 via a disco version entitled "It's in His Kiss" by British vocalist Linda Lewis recorded at Media Sound Recording Studios (NYC) with producers Bert de Couteaux and Tony Silvester in a session which also yielded Lewis' recording of her own composition "Rock and Roller Coaster". Lewis would recall: "Clive [Davis]" - Arista Records founder and president - "sent me over to New York [City] to work with Bert DeCoteaux, who’d [produced] Sister Sledge and people like that...And I had all these amazing backing vocalists, like Deniece Williams and Luther Vandross in the studio. I was like, 'Oh, my God!' I’m just this little girl from the East End...I just went in the studio and just hit the nail on the head, apparently." Clive Davis had the idea of Lewis remaking a classic hit song disco-style and had several "oldies" played for Lewis in the studio: (Lewis quote:)"As soon as ['It's in His Kiss'] came on we all said 'That's the one!'" Lewis would state: "I always loved the song and used to sing it in the bath" while opining that making a disco record "isn't really me". Issued as "It's in His Kiss" — despite containing a variant of the "shoop shoop" background vocal – Lewis' version became a UK Top Ten hit in August 1975:. on July 26, 1975 the track had been ranked at number 13 in its third charting week, its advance to number 8 on the August 2, 1975 chart being assisted by Lewis' performance of the song on the TOTP episode dated July 24, 1975, with the track reaching its UK chart peak of number 6 on August 9, 1975 with a third and final Top Ten ranking at number 9 on August 16, 1975. "It's in His Kiss" also afforded Lewis an Irish Top Ten hit at number 9, and in the US ranked as high as number 11 in club play with peripheral cross-over to the R&B chart in Billboard at number 96, while the track almost reached the Billboard Hot 100, "bubbling under" at number 107. "It's in His Kiss" was included on Lewis' debut Arista Records album release Not a Little Girl Anymore which reached number 40 in the UK Albums Chart. On the episode of Saturday Night Live broadcast May 19, 1979 Linda Ronstadt and Phoebe Snow performed "The Shoop Shoop Song" as a duet: in an October 2008 interview Snow stated that she and Ronstadt "always talked about" recording "The Shoop Shoop Song" adding: "Maybe we still will"; although the duet remained unrecorded at the time of Snow's April 26, 2011 death. When Linda Ronstadt participated in two benefit concerts for Jerry Brown on December 21–22, 1979 she performed "The Shoop Shoop Song". That number - featuring vocal accompaniment from Nicolette Larson - being one of six songs performed by Ronstadt which were announced as tracks on her upcoming album Mad Love": however Mad Love was issued in February 1980 without the inclusion of "The Shoop Shoop Song". Ronstadt performed "The Shoop Shoop Song" as a guest on an episode of The Muppet Show broadcast October 26, 1980. At the Rally For Nuclear Disarmament concert held in Central Park on June 12, 1982 Linda Ronstadt's set included "The Shoop Shoop Song": vocal accompaniment was provided by Nicolette Larson and Rosemary Butler. Had Ronstadt recorded "The Shoop Shoop Song" for her Mad Love album it would have been produced by Peter Asher who would eventually produce the 1990 international smash hit cover by Cher. Cher's cover was cut for the soundtrack of her 1990 film Mermaids in which it played under the closing credits, and the single's U.S. release coincided with the November release of the film. It peaked at number thirty three on the Billboard Hot 100, and number one in the United Kingdom, where it remained for five weeks, selling a total of 520,000 copies, making it one of the biggest-selling singles by a female artist in Britain in the 1990s. The song was Cher's first solo number one single, her previous number one in the United Kingdom had been in 1965 with her then husband Sonny Bono and their first hit: "I Got You Babe". Cher's "The Shoop Shoop Song" also topped the charts in Austria, Ireland and Norway; the single achieved a number two peak in Belgium and top ten status in France, Germany, New Zealand, Australia, Switzerland, Netherlands and Sweden. The success of the single in the United Kingdom and Continental Europe was reflected in its addition to Love Hurts, her subsequent album, as released in those parts of the world, Australia and New Zealand. "The Shoop Shoop Song" was also included in the album's Canadian release but in the U.S. "The Shoop Shoop Song" was not available on a Cher album until the 1999 release of If I Could Turn Back Time: Cher's Greatest Hits. The original video for "The Shoop Shoop Song (It's in His Kiss)" was directed by Marty Callner, and made to promote the movie Mermaids. The video features Cher with Winona Ryder and Christina Ricci, who played her daughters in the film, in a music studio in the clothes and styles of the 1960s period of the film, clips of which are shown throughout. Near the end Cher and the girls are shown in an alley spray-painting a wall. When Mermaids quickly came and went from theaters a revised video was issued which deleted the clips of the film from the video. A brief music video of the original version appeared at the start of the special DTV Romancin', set to clips of kisses from Disney cartoons. An episode of Tiny Toon Adventures also featured an animated music video of the original version, with Babs Bunny lip-syncing to the song. "The Shoop Shoop Song" had its first significant UK profile performed by a male act, the Searchers — with Mike Pender on lead – who cut the song as "It's in Her Kiss" for their April 1964 album release It's the Searchers. The song – similarly entitled as the one recorded by the Searchers– was subsequently recorded by the Hollies. Britgirls Helen Shapiro, Lulu and Sandie Shaw all recorded "It's in His Kiss", though none of these versions was released as a single. In 1974 the song was remade by Australian band The Bootleg Family Band: "The Shoop Shoop Song" was a top 5 hit for the band who later on became known as Avalanche. Also in 1974 Lena Zavaroni recorded "It's in His Kiss" for her album If My Friends Could See Me Now. Kristine Sparkle had a single release of the song uniquely entitled "In His Kiss" (parent album Image). In 1976 Anne Renée (fr) recorded the French language rendering "Embrasse-le" which borrowed the arrangement of the 1975 Linda Lewis disco cover. Kate Taylor remade "It's in His Kiss" at the suggestion of Livingston Taylor: an acoustic rendition featuring a counter vocal by James Taylor (who co-produced the track with Lew Hahn), the Kate Taylor version was recorded August 1977 at Atlantic Recording Studios (NYC) and became Kate Taylor's sole Billboard Hot 100 hit with a #49 peak on the Hot 100 in Billboard magazine, on whose Easy Listening chart the track reached #13. Despite omitting the signature background vocals of the Betty Everett version, the Kate Taylor cover was fully entitled "It's in His Kiss (The Shoop Shoop Song)": the track was featured on Kate Taylor's 1978 self-titled album release. In 1979 Cisse (fi) remade the song as "It's in Her Kiss" for his Summer Party album. The Swinging Blue Jeans hit No. 3 in the UK with their cover of Betty Everett's previous single to "The Shoop Shoop Song", "You're No Good", but the group's version of "It's in Her Kiss" was unreleased until 1998 when it was included on the At Abbey Road compilation. Other versions of "The Shoop Shoop Song" have been cut by the Supremes, Aretha Franklin in 1964, and (as "It's in Her Kiss") by The Newbeats on their debut album Bread & Butter also in 1964. "The Shoop Shoop Song (It's in His Kiss)" was covered by Nancy Boyd & The Capello's (with Darry Campanilla) on the album Let's Hang On! in 1987. Kids Incorporated covered "The Shoop Shoop Song (It's in His Kiss)" in 1991 in the Season 7 episode "A Hard Date's Night". Living Single "It's in His Kiss" along with several other tunes of the era were sung by Fictional Girl Group "The Flavorettes" in 1997 Season 5 Episode, "Up the Ladder to the Roof". The Nylons covered the song as "The Shoop Shoop Song (It's In Her Kiss)" for the album Hits Of The 60's A Cappella Style in 1997. Vonda Shepard did a cover for the album Songs from Ally McBeal in 1997. Mary Duff recorded it as "It's in His Kiss (The Shoop Shoop Song)" for the compilation album The Ultimate Collection in 2005. Anna Book recorded a cover for the album Let's Dance in 2006. Pixie Lott recorded a cover for the episode "Blue For Bluebird" on Inspector George Gently in 2014. Tiny Toon Adventures used Betty Everett's version in an episode entitled "Toon Tv", where the tiny toons show music videos. Tiny toons pays homage to Cher's cover by featuring a reenactment of a scene from "The Little Mermaid". Thalía recorded a cover in Spanish for her campaign with Hershey's kisses. ^ "The Shirelles". History-of-rock.com. Retrieved 2014-03-30. ^ "Maid to Order (1987)". IMDb.com. Retrieved 2015-11-09. ^ "Maid to Order (1987) : Trivia". IMDb.com. Retrieved 2015-11-09. ^ "*OPALS (4) - doo-wop". Blogg.org. Retrieved 2015-11-09. ^ Marsh, Dave (1989). The Heart of Rock and Soul. New York: Plume. p. 398. ISBN 978-0306809019. ^ "Linda Lewis: freeing the lark within". SoulMusic.com. Archived from the original on September 24, 2015. Retrieved June 8, 2015. ^ a b Iles, Jan (26 July 1975). "Lady Linda gets a toe-hold". Record Mirror. p. 8. ^ a b Roberts, David (2006). British Hit Singles & Albums (19th ed.). London: Guinness World Records Limited. p. 320. ISBN 1-904994-10-5. ^ "LINDA LEWIS | full Official Chart History | Official Charts Company". Officialcharts.com. Retrieved 2015-11-09. ^ "Linda Lewis Songs ••• Top Songs / Chart Singles Discography ••• Music VF, US & UK hits charts". Musicvf.com. Retrieved 2015-11-09. ^ "Phoebe Snow: the Out in Hollywood Interview". Blogs.Dailynews.com. Retrieved December 30, 2013. ^ "Mad Love". St Petersburg Times. 96 (170): 53. January 10, 1980. ^ a b "Shoop Shoop Song Single". Sites.google.com. Retrieved 2014-03-30. ^ "Australian-charts.com – Cher – The Shoop Shoop Song (It's in His Kiss)". ARIA Top 50 Singles. Retrieved November 3, 2015. ^ "Austriancharts.at – Cher – The Shoop Shoop Song (It's in His Kiss)" (in German). Ö3 Austria Top 40. Retrieved November 3, 2015. ^ "Ultratop.be – Cher – The Shoop Shoop Song (It's in His Kiss)" (in Dutch). Ultratop 50. Retrieved November 3, 2015. ^ "Top RPM Singles: Issue 1436." RPM. Library and Archives Canada. Retrieved November 3, 2015. ^ "Top RPM Adult Contemporary: Issue 1433." RPM. Library and Archives Canada. Retrieved November 3, 2015. ^ "Top European Singles" (PDF) (in German). Music & Media. Retrieved November 3, 2015. ^ "Hits of the World" (PDF). Billboard. Retrieved November 3, 2015. ^ "Lescharts.com – Cher – The Shoop Shoop Song (It's in His Kiss)" (in French). Les classement single. Retrieved November 3, 2015. ^ "Cher - Top Titel" (in German). GfK Entertainment. Retrieved November 3, 2015. ^ "The Irish Charts – Search Results – The Shoop Shoop Song (It's in His Kiss)". Irish Singles Chart. Retrieved November 3, 2015. ^ "Nederlandse Top 40 – week 27, 1991" (in Dutch). Dutch Top 40 Retrieved November 3, 2015. ^ "Dutchcharts.nl – Cher – The Shoop Shoop Song (It's in His Kiss)" (in Dutch). Single Top 100. Retrieved November 3, 2015. ^ "Charts.nz – Cher – The Shoop Shoop Song (It's in His Kiss)". Top 40 Singles. Retrieved November 3, 2015. ^ "Norwegiancharts.com – Cher – The Shoop Shoop Song (It's in His Kiss)". VG-lista. Retrieved November 3, 2015. ^ "Top 10 Portugal" (PDF). Music & Media. Retrieved 2018-03-22. ^ "Swedishcharts.com – Cher – The Shoop Shoop Song (It's in His Kiss)". Singles Top 100. Retrieved November 3, 2015. ^ "Swisscharts.com – Cher – The Shoop Shoop Song (It's in His Kiss)". Swiss Singles Chart. Retrieved November 3, 2015. ^ "Cher: Artist Chart History". Official Charts Company. Retrieved November 3, 2015. ^ "Cher Chart History (Hot 100)". Billboard. Retrieved November 3, 2015. ^ "Cher Chart History (Adult Contemporary)". Billboard. Retrieved November 3, 2015. ^ "Billboard Magazine, June 07 Issue: 1997". Billboard. Retrieved November 3, 2015. ^ "Listy bestsellerów, wyróżnienia :: Związek Producentów Audio-Video". Polish Airplay Top 100. Retrieved April 15, 2019. ^ "ARIA Charts - End Of Year Charts - Top 50 Singles 1991". ARIA. Archived from the original on February 29, 2016. Retrieved November 3, 2015. ^ "Jahreshitparade Singles 1991" (in German). Hung Medien. Retrieved November 3, 2015. ^ "Jaaroverzichten 1991" (in Dutch). Ultratop. Retrieved November 3, 2015. ^ "European hit Radio 1991, page 20" (PDF). Music & Media. Retrieved October 28, 2015. ^ "European Hot 100 Singles 1991, page 21" (PDF). Music & Media. Retrieved October 28, 2015. ^ "RPM 100 Adult Contemporary Tracks of 1991". RPM. Retrieved November 3, 2015. ^ "Top 100 Single-Jahrescharts" (in German). GfK Entertainment. Retrieved November 3, 2015. ^ "Single Top 100 Van 1991" (PDF) (in Dutch). Stichting Nederlandse Top 40. Retrieved November 3, 2015. ^ "Jaaroverzichten - single 1991". Hung Medien. Retrieved November 3, 2015. ^ "Top Selling Singles of 1991". RIANZ. Retrieved November 3, 2015. ^ "Topp 20 Single Vår 1991" (in Norwegian). VG-lista. Retrieved November 3, 2015. ^ "Swiss Year-end Charts 1991". Hung Medien. Retrieved November 3, 2015. ^ "1991 Top 100 Singles". Music Week. London, England: Spotlight Publications: 20. 11 January 1992. ^ "The Year in Music: 1991" (PDF). Billboard. Retrieved November 3, 2015. ^ "Austriancharts.at - Besstenlisten - 90er Single". Hung Medien. Retrieved June 15, 2011. ^ "Best of All Time - Singles". Hung Medien. Archived from the original on August 14, 2014. Retrieved August 15, 2016. ^ "Austrian single certifications – Cher – The Shoop Shoop Song (It's in His Kiss)" (in German). IFPI Austria. Enter Cher in the field Interpret. Enter The Shoop Shoop Song (It's in His Kiss) in the field Titel. Select single in the field Format. Click Suchen. ^ "Les Singles en Argent" (in French). InfoDisc. Archived from the original on January 3, 2015. Retrieved August 13, 2013. ^ "French single certifications – Cher – The Shoop Shoop Song (It's In His Kiss)" (in French). InfoDisc. Select CHER and click OK.
^ "Gold-/Platin-Datenbank (Cher; 'The Shoop Shoop Song')" (in German). Bundesverband Musikindustrie. ^ "NZ chart book : Cher" (PDF). Mediafire.com. Retrieved 2015-11-09. ^ "British single certifications – Cher – The Shoop Shoop Song (It's in His Kiss)". British Phonographic Industry. Select singles in the Format field. Select Gold in the Certification field. Type The Shoop Shoop Song (It's in His Kiss) in the "Search BPI Awards" field and then press Enter. ^ "The Shoop Shoop Song (It's In His Kiss) - BOOTLEG FAMILY BAND (1974)". Pop Archives. Retrieved 2014-03-30.